Having qualified for the All-Ireland Confined Drama Finals in Doonbeg, Co Clare, next week, Skibbereen Theatre Society will be staging two performances of Martin McDonagh’s black comedy, The Beauty Queen of Leenane. Before their appearance in the finals on Friday, April 12th, they will be putting on their multi-award-winning production at Skibbereen Town Hall this Sunday, 7th, and again on Tuesday next, 9th, at 8pm both nights. These will be the final two local performances. On the amateur drama festival circuit, the show chalked up three wins, three second placings and a third, with director Ger Minihane, cast and crew members winning several awards. The cast comprises Mary O’Driscoll, Catherine Field, Kevin Cadogan and Josh Campbell. Tickets are available from Thornhill Bros Electrical, Skibbereen, telephone 028-22557. Advance booking is recommended. 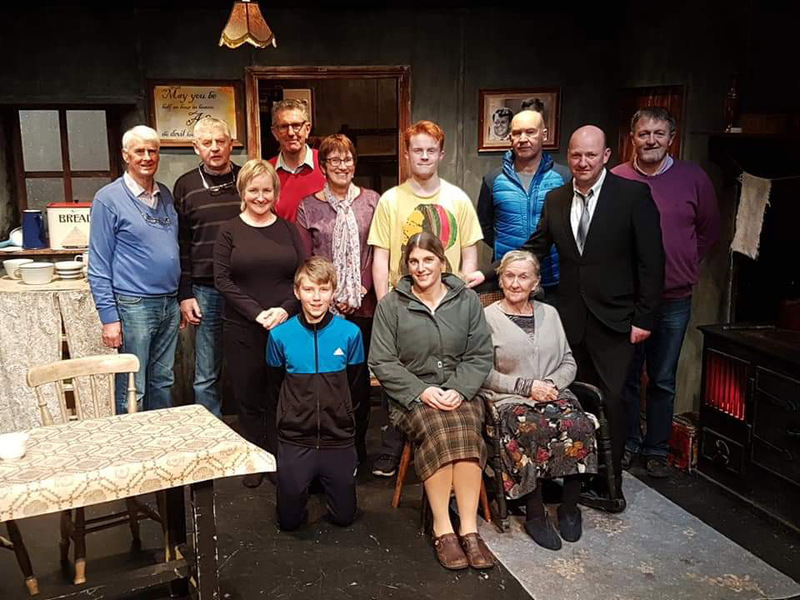 The cast and some of the crew of Skibbereen Theatre Society’s production of ‘The Beauty Queen of Leenane’ pictured on tour in Glenamaddy – front from left – Eoin O’Sullivan, Mary O’Driscoll and Catherine Field. Standing: Charlie Keohane, Barty Connolly, Angela Galvin, Fachtna and Carmel O’Driscoll. Josh Campbell, Gerry Minihane (director), Kevin Cadogan and Gearóid MacEoin.